This article is about Kathmandu Metropolitan City. For other uses, see Kathmandu (disambiguation). Kathmandu (/ˌkætmænˈduː/; Nepali: काठमाडौं, Nepal Bhasa: य़े: Yei, Nepali pronunciation: [kaʈʰmaɳɖu]) is the capital city and largest city of Nepal with a population of around 1 million. 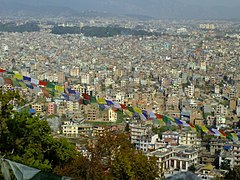 Kathmandu is also the largest metropolis in the Himalayan hill region. Nepali is the most spoken language in the city, while English is widely understood. The City of Temples stands at an elevation of approximately 1,400 metres (4,600 feet) above sea level in the bowl-shaped Kathmandu Valley of central Nepal. The valley is historically termed as "Nepal Mandala" and has been the home of Newar culture, a cosmopolitan urban civilisation in the Himalayan foothills. The city was the royal capital of the Kingdom of Nepal and hosts palaces, mansions and gardens of the Nepalese aristocracy. It has been home to the headquarters of the South Asian Association for Regional Cooperation (SAARC) since 1985. Today, it is the seat of government of the Nepalese republic established in 2008; and is part of the Province No. 3 in Nepalese administrative geography. Kathmandu is and has been for many years the centre of Nepal's history, art, culture and economy. It has a multiethnic population within a Hindu and Buddhist majority. It is also the home of the Newars. Religious and cultural festivities form a major part of the lives of people residing in Kathmandu. Tourism is an important part of the economy; in 2013, Kathmandu was ranked third among the top ten upcoming travel destinations in the world by TripAdvisor, and ranked first in Asia. The city is the gateway to the Nepalese Himalayas, and home to seven world heritage sites: the Durbar Squares of Hanuman Dhoka, Patan and Bhaktapur; the Stupas of Swayambhunath and Baudhanath; and the temples of Pashupati and Changu Narayan. There are also seven casinos in the city. Historic areas of Kathmandu were severely damaged by a 7.8 magnitude earthquake on 25 April 2015. Some of the buildings have been restored and some are in the process of reconstruction. NCP’s Bidya Sundar Shakya is the Mayor of Kathmandu Metropolitan city and Hari Prabha Khadgi of Nepali Congress is the deputy mayor. Indigenous Newari term for Kathmandu valley is Yei. The Pahari name Kathmandu comes from Kasthamandap temple, that stood in Durbar Square. In Sanskrit, Kastha (Sanskrit: काष्ठ) means "Wood" and Maṇḍapa (Sanskrit: मन्डप) means "Pavilion". This public pavilion, also known as Maru Satta: in the Newar language, was rebuilt in 1596 by Biseth in the period of King Laxmi Narsingh Malla. The three-story structure was made entirely of wood and used no iron nails nor supports. According to legend, all the timber used to build the pagoda was obtained from a single tree. The structure collapsed during a major earthquake on 25 April 2015. The colophons of ancient manuscripts, dated as late as the 20th century, refer to Kathmandu as Kāṣṭhamaṇḍap Mahānagar in Nepal Mandala. Mahānagar means "great city". The city is called "Kāṣṭhamaṇḍap" in a vow that Buddhist priests still recite to this day. Thus, Kathmandu is also known as Kāṣṭhamaṇḍap. During medieval times, the city was sometimes called Kāntipur (कान्तिपुर). This name is derived from two Sanskrit words – Kānti and pur. "Kānti" is a word that stands for "beauty" and is mostly associated with light and "pur" means place. Thus, giving it a meaning as "City of light". Archaeological excavations in parts of Kathmandu have found evidence of ancient civilisations. The oldest of these findings is a statue, found in Maligaon, that was dated at 185 AD. The excavation of Dhando Chaitya uncovered a brick with an inscription in Brahmi script. Archaeologists believe it is two thousand years old. Stone inscriptions are a ubiquitous element at heritage sites and are key sources for the history of Nepal. 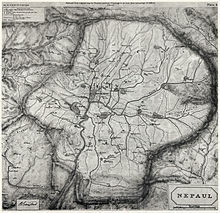 The earliest Western reference to Kathmandu appears in an account of Jesuit Fathers Johann Grueber and Albert d'Orville. In 1661, they passed through Nepal on their way from Tibet to India, and reported that they reached "Cadmendu", the capital of Nepal kingdom. The ancient history of Kathmandu is described in its traditional myths and legends. According to Swayambhu Purana, present-day Kathmandu was once a huge and deep lake named "Nagdaha", as it was full of snakes. The lake was cut drained by Bodhisatwa Manjusri with his sword, and the water was evacuated out from there. He then established a city called Manjupattan, and made Dharmakar the ruler of the valley land. After some time, a demon named Banasur closed the outlet, and the valley again turned into a lake. Then lord Krishna came to Nepal, killed Banasur, and again drained out the water. He brought some Gopals along with him and made Bhuktaman the king of Nepal. Kotirudra Samhita of Shiva Purana, Chapter 11, shloka 18 refers to the place as Nayapala city, which was famous for its Pashupati Shivalinga. The name Nepal probably originates from this city Nayapala. Very few historical record exists of the period before medieval Licchavis rulers. According to Gopalraj Vansawali, a genealogy of Nepali monarchy, the rulers of Kathmandu Valley before the Licchavis were Gopalas, Mahispalas, Aabhirs, Kirants, and Somavanshi. The Kirata dynasty was established by Yalamber. During the Kirata era, a settlement called Yambu existed in the northern half of old Kathmandu. In some of the Sino-Tibetan languages, Kathmandu is still called Yambu. Another smaller settlement called Yengal was present in the southern half of old Kathmandu, near Manjupattan. During the reign of the seventh Kirata ruler, Jitedasti, Buddhist monks entered Kathmandu valley and established a forest monastery at Sankhu. The Licchavis from the Indo-Gangetic plain migrated north and defeated the Kiratas, establishing the Licchavi dynasty, circa 400 AD. During this era, following the genocide of Shakyas in Lumbini by Virudhaka, the survivors migrated north and entered the forest monastery lora masquerading as Koliyas. 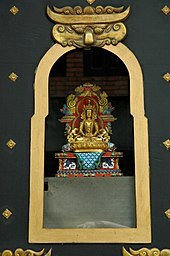 From Sankhu, they migrated to Yambu and Yengal (Lanjagwal and Manjupattan) and established the first permanent Buddhist monasteries of Kathmandu. This created the basis of Newar Buddhism, which is the only surviving Sanskrit-based Buddhist tradition in the world. With their migration, Yambu was called Koligram and Yengal was called Dakshin Koligram during most of the Licchavi era. Eventually, the Licchavi ruler Gunakamadeva merged Koligram and Dakshin Koligram, founding the city of Kathmandu. The city was designed in the shape of Chandrahrasa, the sword of Manjushri. The city was surrounded by eight barracks guarded by Ajimas. One of these barracks is still in use at Bhadrakali (in front of Singha Durbar). The city served as an important transit point in the trade between India and Tibet, leading to tremendous growth in architecture. Descriptions of buildings such as Managriha, Kailaskut Bhawan, and Bhadradiwas Bhawan have been found in the surviving journals of travellers and monks who lived during this era. For example, the famous 7th-century Chinese traveller Xuanzang described Kailaskut Bhawan, the palace of the Licchavi king Amshuverma. The trade route also led to cultural exchange as well. The artistry of the Newar people—the indigenous inhabitants of the Kathmandu Valley—became highly sought after during this era, both within the Valley and throughout the greater Himalayas. Newar artists travelled extensively throughout Asia, creating religious art for their neighbours. For example, Araniko led a group of his compatriot artists through Tibet and China. Bhrikuti, the princess of Nepal who married Tibetan monarch Songtsän Gampo, was instrumental in introducing Buddhism to Tibet. The Licchavi era was followed by the Malla era. Rulers from Tirhut, upon being attacked by Muslims, fled north to the Kathmandu valley. They intermarried with Nepali royalty, and this led to the Malla era. The early years of the Malla era were turbulent, with raids and attacks from Khas and Turk Muslims. There was also a devastating earthquake which claimed the lives of a third of Kathmandu's population, including the king Abhaya Malla. These disasters led to the destruction of most of the architecture of the Licchavi era (such as Mangriha and Kailashkut Bhawan), and the loss of literature collected in various monasteries within the city. Despite the initial hardships, Kathmandu rose to prominence again and, during most of the Malla era, dominated the trade between India and Tibet. Nepali currency became the standard currency in trans-Himalayan trade. During the later part of the Malla era, Kathmandu Valley comprised four fortified cities: Kantipur, Lalitpur, Bhaktapur, and Kirtipur. These served as the capitals of the Malla confederation of Nepal. These states competed with each other in the arts, architecture, aesthetics, and trade, resulting in tremendous development. The kings of this period directly influenced or involved themselves in the construction of public buildings, squares, and temples, as well as the development of waterspouts, the institutionalisation of trusts (called guthis), the codification of laws, the writing of dramas, and the performance of plays in city squares. Evidence of an influx of ideas from India, Tibet, China, Persia, and Europe among other places can be found in a stone inscription from the time of king Pratap Malla. Books have been found from this era that describe their tantric tradition (e.g. Tantrakhyan), medicine (e.g. Haramekhala), religion (e.g. Mooldevshashidev), law, morals, and history. Amarkosh, a Sanskrit-Nepal Bhasa dictionary from 1381 AD, was also found. Architecturally notable buildings from this era include Kathmandu Durbar Square, Patan Durbar Square, Bhaktapur Durbar Square, the former durbar of Kirtipur, Nyatapola, Kumbheshwar, the Krishna temple, and others. The Gorkha Kingdom ended the Malla confederation after the Battle of Kathmandu in 1768. This marked the beginning of the modern era in Kathmandu. The Battle of Kirtipur was the start of the Gorkha conquest of the Kathmandu Valley. Kathmandu was adopted as the capital of the Gorkha empire, and the empire itself was dubbed Nepal. During the early part of this era, Kathmandu maintained its distinctive culture. Buildings with characteristic Nepali architecture, such as the nine-story tower of Basantapur, were built during this era. However, trade declined because of continual war with neighbouring nations. Bhimsen Thapa supported France against Great Britain; this led to the development of modern military structures, such as modern barracks in Kathmandu. The nine-storey tower Dharahara was originally built during this era. Rana rule over Nepal started with the Kot Massacre, which occurred near Hanuman Dhoka Durbar. During this massacre, most of Nepal's high-ranking officials were massacred by Jang Bahadur Rana and his supporters. Another massacre, the Bhandarkhal Massacre, was also conducted by Kunwar and his supporters in Kathmandu. During the Rana regime, Kathmandu's alliance shifted from anti-British to pro-British; this led to the construction of the first buildings in the style of Western European architecture. The most well-known of these buildings include Singha Durbar, Garden of Dreams, Shital Niwas, and the old Narayanhiti palace. The first modern commercial road in the Kathmandu Valley, the New Road, was also built during this era. Trichandra College (the first college of Nepal), Durbar School (the first modern school of Nepal), and Bir Hospital (the first hospital of Nepal) were built in Kathmandu during this era. Rana rule was marked by despotism, economic exploitation and religious persecution. Kathmandu is in the northwestern part of the Kathmandu Valley to the north of the Bagmati River and covers an area of 50.7 km2 (19.6 sq mi). The average elevation is 1,400 metres (4,600 ft) above sea level. The city is bounded by several other municipalities of the Kathmandu valley: south of the Bagmati by Lalitpur Sub-Metropolitan City (Patan), with which it forms one urban area surrounded by a ring road, to the southwest by Kirtipur Municipality and to the east by Madyapur Thimi Municipality. To the north the urban area extends into several Village Development Committees. However, the urban agglomeration extends well beyond the neighbouring municipalities, e.g. to Bhaktapur, and nearly covers the entire Kathmandu Valley. Kathmandu is dissected by eight rivers, the main river of the valley, the Bagmati and its tributaries, of which the Bishnumati, Dhobi Khola, Manohara Khola, Hanumante Khola, and Tukucha Khola are predominant. The mountains from where these rivers originate are in the elevation range of 1,500–3,000 metres (4,900–9,800 ft), and have passes which provide access to and from Kathmandu and its valley. An ancient canal once flowed from Nagarjuna hill through Balaju to Kathmandu; this canal is now extinct. Kathmandu and its valley are in the Deciduous Monsoon Forest Zone (altitude range of 1,200–2,100 metres (3,900–6,900 ft)), one of five vegetation zones defined for Nepal. The dominant tree species in this zone are oak, elm, beech, maple and others, with coniferous trees at higher altitude. New road, is the shopping district of Kathmandu. Kathmandu and adjacent cities are composed of neighbourhoods, which are utilised quite extensively and more familiar among locals. However, administratively the city is divided into 32 wards, numbered from 1 to 32. Five major climatic regions are found in Nepal. Of these, Kathmandu Valley is in the Warm Temperate Zone (elevation ranging from 1,200 to 2,300 metres (3,900 to 7,500 ft)), where the climate is fairly temperate, atypical for the region. This zone is followed by the Cool Temperate Zone with elevation varying between 2,100 and 3,300 metres (6,900 and 10,800 ft). Under Köppen's climate classification, portions of the city with lower elevations have a humid subtropical climate (Cwa), while portions of the city with higher elevations generally have a subtropical highland climate. 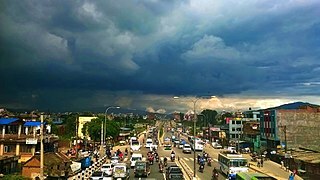 In the Kathmandu Valley, which is representative of its valley's climate, the average summer temperature varies from 28 to 30 °C (82 to 86 °F). The average winter temperature is 10.1 °C (50.2 °F). The city generally has a climate with warm days followed by cool nights and mornings. Unpredictable weather is expected, given that temperatures can drop to 1 °C (34 °F) or less during the winter. During a 2013 cold front, the winter temperatures of Kathmandu dropped to −4 °C (25 °F), and the lowest temperature was recorded on 10 January 2013, at −9.2 °C (15.4 °F). Rainfall is mostly monsoon-based (about 65% of the total concentrated during the monsoon months of June to August), and decreases substantially (100 to 200 cm (39 to 79 in)) from eastern Nepal to western Nepal. Rainfall has been recorded at about 1,400 millimetres (55.1 in) for the Kathmandu valley, and averages 1,407 millimetres (55.4 in) for the city of Kathmandu. On average humidity is 75%. The chart below is based on data from the Nepal Bureau of Standards & Meteorology, "Weather Meteorology" for 2005. The chart provides minimum and maximum temperatures during each month. The annual amount of precipitation was 1,124 millimetres (44.3 in) for 2005, as per monthly data included in the table above. The decade of 2000–2010 saw highly variable and unprecedented precipitation anomalies in Kathmandu. This was mostly due to the annual variation of the southwest monsoon. For example, 2003 was the wettest year ever in Kathmandu, totalling over 2,900 mm (114 in) of precipitation due to an exceptionally strong monsoon season. In contrast, 2001 recorded only 356 mm (14 in) of precipitation due to an extraordinarily weak monsoon season. Air pollution is a major issue in Kathmandu. According to the 2016 World Health Organization's Ambient Air Pollution Database, the annual average PM2.5 concentration in 2013 was 49 μg/m3, which is 4.9 times higher than recommended by the World Health Organization. for annual average PM2.5. Starting in early 2017, the Nepali Government and US Embassy have monitored and publicly share real-time air quality data. The location and terrain of Kathmandu have played a significant role in the development of a stable economy which spans millennia. The city is in an ancient lake basin, with fertile soil and flat terrain. This geography helped form a society based on agriculture. This, combined with its location between India and China, helped establish Kathmandu as an important trading centre over the centuries. Kathmandu's trade is an ancient profession that flourished along an offshoot of the Silk Road which linked India and Tibet. From centuries past, Lhasa Newar merchants of Kathmandu have conducted trade across the Himalaya and contributed to spreading art styles and Buddhism across Central Asia. Other traditional occupations are farming, metal casting, woodcarving, painting, weaving, and pottery. Kathmandu is the most important industrial and commercial centre in Nepal. The Nepal Stock Exchange, the head office of the national bank, the chamber of commerce, as well as head offices of national and international banks, telecommunication companies, the electricity authority, and various other national and international organisations are in Kathmandu. The major economic hubs are the New Road, Durbar Marg, Ason and Putalisadak. The economic output of the metropolitan area alone is worth more than one third of national GDP around $6.5billion in terms of nominal GDP NR.s 550 billion approximately per year $2200 per capita income approx three times national average. Kathmandu exports handicrafts, artworks, garments, carpets, pashmina, paper; trade accounts for 21% of its finances.[which?] Manufacturing is also important and accounts for 19% of the revenue that Kathmandu generates. Garments and woolen carpets are the most notable manufactured products. Other economic sectors in Kathmandu include agriculture (9%), education (6%), transport (6%), and hotels and restaurants (5%). Kathmandu is famous for lokta paper and pashmina shawls. Tourism is considered another important industry in Nepal. This industry started around 1950, as the country's political makeup changed and ended the country's isolation from the rest of the world. In 1956, air transportation was established and the Tribhuvan Highway, between Kathmandu and Raxaul (at India's border), was started. Separate organisations were created in Kathmandu to promote this activity; some of these include the Tourism Development Board, the Department of Tourism and the Civil Aviation Department. Furthermore, Nepal became a member of several international tourist associations. Establishing diplomatic relations with other nations further accentuated this activity. The hotel industry, travel agencies, training of tourist guides, and targeted publicity campaigns are the chief reasons for the remarkable growth of this industry in Nepal, and in Kathmandu in particular. Since then, tourism in Nepal has thrived. It is the country's most important industry. Tourism is a major source of income for most of the people in the city, with several hundred thousand visitors annually. Hindu and Buddhist pilgrims from all over the world visit Kathmandu's religious sites such as Pashupatinath, Swayambhunath, Boudhanath, Changunarayan and Budhanilkantha. From a mere 6,179 tourists in 1961/62, the number increased to 491,504 in 1999/2000. Following the end of the Maoist insurgency, there was a significant rise of 509,956 tourist arrivals in 2009. Since then, tourism has improved as the country turned into the Democratic Republic. In economic terms, the foreign exchange registered 3.8% of the GDP in 1995/96 but then started declining[why?]. The high level of tourism is attributed to the natural grandeur of the Himalayas and the rich cultural heritage of the country. The neighbourhood of Thamel is Kathmandu's primary "traveller's ghetto", packed with guest houses, restaurants, shops, and bookstores, catering to tourists. Another neighbourhood of growing popularity is Jhamel, a name for Jhamsikhel that was coined to rhyme with Thamel. Jhochhen Tol, also known as Freak Street, is Kathmandu's original traveller's haunt, made popular by the hippies of the 1960s and 1970s; it remains a popular alternative to Thamel. Asan is a bazaar and ceremonial square on the old trade route to Tibet, and provides a fine example of a traditional neighbourhood. With the opening of the tourist industry after the change in the political scenario of Nepal in 1950, the hotel industry drastically improved. Now Kathmandu boasts several luxuries such as the Hyatt Regency, Dwarika's, theYak & Yeti, The Everest Hotel, Hotel Radisson, Hotel De L'Annapurna, The Malla Hotel, Shangri-La Hotel (which is not operated by the Shangri-La Hotel Group) and The Shanker Hotel. There are several four-star hotels such as Hotel Vaishali, Hotel Narayani, The Blue Star and Grand Hotel. The Garden Hotel, Hotel Ambassador, and Aloha Inn are among the three-star hotels in Kathmandu. Hotels like Hyatt Regency, De L'Annapurna, and Hotel Yak & Yeti are among the five-star hotels providing casinos as well. Kathmandu Municipal Corporation (KMC) is the chief nodal agency for the administration of Kathmandu. The Municipality of Kathmandu was upgraded to incorporated in 1994. Metropolitan Kathmandu is divided into five sectors: the Central Sector, the East Sector, the North Sector, the City Core and the West Sector. For civic administration, the city is further divided into 35 administrative wards. The Council administers the Metropolitan area of Kathmandu city through its 177 elected representatives and 20 nominated members. It holds biannual meetings to review, process and approve the annual budget and make major policy decisions. The ward's profile documents for the 35 wards prepared by the Kathmandu Metropolitan Council is detailed and provides information for each ward on population, the structure and condition of houses, the type of roads, educational, health and financial institutions, entertainment facilities, parking space, security provisions, etc. It also includes lists of development projects completed, on-going and planned, along with informative data about the cultural heritage, festivals, historical sites and the local inhabitants. Ward 16 is the largest, with an area of 437.4 ha; ward 26 is the smallest, with an area of 4 ha. Kathmandu is the headquarters of the surrounding Kathmandu District. The city of Kathmandu forms this district with Kirtipur Municipality and some 57 Village Development Committees. According to the 2001 census, there are 235,387 households in the metropolitan city. The Metropolitan Police is the main law enforcement agency in the city. It is headed by a commissioner of police. The Metropolitan Police is a division of the Nepal Police, and the administrative control lies with the National Home Ministry. The fire service, known as the Barun Yantra Karyalaya, opened its first station in Kathmandu in 1937 with a single vehicle. An iron tower was erected to monitor the city and watch for fire. As a precautionary measure, firemen were sent to the areas which were designated as accident-prone areas. In 1944, the fire service was extended to the neighbouring cities of Lalitpur and Bhaktapur. In 1966, a fire service was established in Kathmandu airport. In 1975, a West German government donation added seven fire engines to Kathmandu's fire service. The fire service in the city is also overlooked by an international non-governmental organisation, the Firefighters Volunteer Association of Nepal (FAN), which was established in 2000 with the purpose of raising public awareness about fire and improving safety. Electricity in Kathmandu is regulated and distributed by the NEA Nepal Electricity Authority. Water supply and sanitation facilities are provided by the Kathmandu Upatyaka Khanepani Limited (KUKL). There is a severe shortage of water for household purposes such as drinking, bathing, cooking and washing and irrigation. People have been using mineral water bottle and mineral water tanks for all the purposes related to water. Melamchi water supply million litres per day of water by the end of 2019. There is no proper waste management in Kathmandu, so rubbish piles up on roads, pavements and in waterways. Not only that , people use to throw wastes and garbages in religious places too. Waste management may be through composting in municipal waste management units, and at houses with home composting units. Both systems are common and established in India and neighbouring countries. Kathmandu's urban cosmopolitan character has made it the most populous city in Nepal, recording a population of 671,846 residents living in 235,387 households in the metropolitan area, according to the 2001 census. According to the National Population Census of 2011, the total population of Kathmandu city was 975,543 with an annual growth rate of 6.12% with respect to the population figure of 2001. 70% of the total population residing in Kathmandu are aged between 15 and 59. Over the years the city has been home to people of various ethnicities, resulting in a range of different traditions and cultural practices. In one decade, the population increased from 427,045 in 1991 to 671,805 in 2001. The population was projected to reach 915,071 in 2011 and 1,319,597 by 2021. To keep up this population growth, the KMC-controlled area of 5,076.6 hectares (12,545 acres) has expanded to 8,214 hectares (20,300 acres) in 2001. With this new area, the population density which was 85 in 1991 is still 85 in 2001; it is likely to jump to 111 in 2011 and 161 in 2021. The largest ethnic groups residing in Kathmandu Metropolitan City consists of primarily Newar (24%), Khas Brahmins (25%), Chhetris (18%), Tamangs (11%) while the rest 12% are occupied by Hill Janajatis including Kirat, Gurung, Magar, Sherpa etc, Terai Janajatis like Tharus along with various ethicities within the Madhesi of 15% community. More recently, other hill ethnic groups and Caste groups from Terai have come to represent a substantial proportion of the city's population. The major languages are Nepali and Nepal Bhasa, while English is understood by many, particularly in the service industry. According to data from 2011, the major religions in Kathmandu city are Hinduism 81.3%, Buddhism 9%, Muslim 4.4% and other 5.2%. The linguistic profile of Kathmandu underwent drastic changes during the Shah dynasty's rule because of its strong bias towards the Hindu culture. Sanskrit language therefore was preferred and people were encouraged to learn it even by attending Sanskrit learning centres in Terai. Sanskrit schools were specially set up in Kathmandu and in the Terai region to inculcate traditional Hindu culture and practices originated from Nepal. The ancient trade route between India and Tibet that passed through Kathmandu enabled a fusion of artistic and architectural traditions from other cultures to be amalgamated with local art and architecture. The monuments of Kathmandu City have been influenced over the centuries by Hindu and Buddhist religious practices. The architectural treasure of the Kathmandu valley has been categorised under the well-known seven groups of heritage monuments and buildings. In 2006 UNESCO declared these seven groups of monuments as a World Heritage Site (WHS). The seven monuments zones cover an area of 189 hectares (470 acres), with the buffer zone extending to 2,394 hectares (5,920 acres). The Seven Monument Zones (Mzs) inscribed originally in 1979 and with a minor modification in 2006 are Durbar squares of Hanuman Dhoka, Patan and Bhaktapur, Hindu temples of Pashupatinath and Changunarayan, the Buddhist stupas of Swayambhu and Boudhanath. The literal meaning of Durbar Square is a "place of palaces". There are three preserved Durbar Squares in Kathmandu valley and one unpreserved in Kirtipur. The Durbar Square of Kathmandu is in the old city and has heritage buildings representing four kingdoms (Kantipur, Lalitpur, Bhaktapur, Kirtipur); the earliest is the Licchavi dynasty. 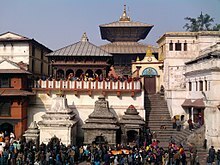 The complex has 50 temples and is distributed in two quadrangles of the Durbar Square. The outer quadrangle has the Kasthamandap, Kumari Ghar, and Shiva-Parvati Temple; the inner quadrangle has the Hanuman Dhoka palace. The squares were severely damaged in the April 2015 Nepal earthquake. Hanuman Dhoka is a complex of structures with the Royal Palace of the Malla kings and of the Shah dynasty. It is spread over five acres. The eastern wing, with ten courtyards, is the oldest part, dating to the mid-16th century. It was expanded by King Pratap Malla in the 17th century with many temples. The royal family lived in this palace until 1886 when they moved to Narayanhiti Palace. The stone inscription outside is in fifteen languages. Kumari Ghar is a palace in the centre of the Kathmandu city, next to the Durbar square where a Royal Kumari selected from several Kumaris resides. Kumari, or Kumari Devi, is the tradition of worshipping young pre-pubescent girls as manifestations of the divine female energy or devi in South Asian countries. In Nepal the selection process is very rigorous. Kumari is believed to be the bodily incarnation of the goddess Taleju (the Nepali name for Durga) until she menstruates, after which it is believed that the goddess vacates her body. Serious illness or a major loss of blood from an injury are also causes for her to revert to common status. The current Royal Kumari, Matina Shakya, age four, was installed in October 2008 by the Maoist government that replaced the monarchy. Kasthamandap is a three-storeyed temple enshrining an image of Gorakhnath. It was built in the 16th century in pagoda style. The name of Kathmandu is a derivative of the word Kasthamandap. It was built under the reign of King Laxmi Narsingha Malla. Kasthamandap stands at the intersection of two ancient trade routes linking India and Tibet at Maru square. It was originally built as a rest house for travellers. The Pashupatinath Temple is a famous 5th century Hindu temple dedicated to Lord Shiva (Pashupati). On the banks of the Bagmati River, Pashupatinath Temple is the oldest Hindu temple in Kathmandu. It served as the seat of national deity, Lord Pashupatinath, until Nepal was secularised. However, a significant part of the temple was destroyed by Mughal invaders in the 14th century and little or nothing remains of the original 5th-century temple exterior. The temple as it stands today was built in the 19th century, although the image of the bull and the black four-headed image of Pashupati are at least 300 years old. The temple is a UNESCO World Heritage Site. Shivaratri, or the night of Lord Shiva, is the most important festival that takes place here, attracting thousands of devotees and sadhus. Believers in Pashupatinath (mainly Hindus) are allowed to enter the temple premises, but non-Hindu visitors are allowed to view the temple only from the across the Bagmati River. The priests who perform the services at this temple have been Brahmins from Karnataka, South India since the time of Malla king Yaksha Malla. This tradition is believed to have been started at the request of Adi Shankaracharya who sought to unify the states of Bharatam (Unified India) by encouraging cultural exchange. This procedure is followed in other temples around India, which were sanctified by Adi Shankaracharya. The temple is built in the pagoda style of architecture, with cubic constructions and carved wooden rafters (tundal) on which they rest, and two-level roofs made of copper and gold. The Boudhanath (also written as Bouddhanath, Bodhnath, Baudhanath or the Khāsa Chaitya), is one of the holiest Buddhist sites in Nepal, along with the Swayambhu. It is a very popular tourist site. Boudhanath is known as Khāsti by Newars and as Bauddha or Bodhnāth by speakers of Nepali. About 11 km (7 mi) from the centre and northeastern outskirts of Kathmandu, the stupa's massive mandala makes it one of the largest spherical stupas in Nepal. Boudhanath became a UNESCO World Heritage Site in 1979. Boudhanath Stupa, one of the largest in Nepal. It is shown during renovations following the 2015 earthquake. The base of the stupa has 108 small depictions of the Dhyani Buddha Amitabha. It is surrounded with a brick wall with 147 niches, each with four or five prayer wheels engraved with the mantra, om mani padme hum. At the northern entrance where visitors must pass is a shrine dedicated to Ajima, the goddess of smallpox. Every year the stupa attracts many Tibetan Buddhist pilgrims who perform full body prostrations in the inner lower enclosure, walk around the stupa with prayer wheels, chant, and pray. Thousands of prayer flags are hoisted up from the top of the stupa downwards and dot the perimeter of the complex. The influx of many Tibetan refugees from China has seen the construction of over 50 Tibetan gompas (monasteries) around Boudhanath. Swayambhu is a Buddhist stupa atop a hillock at the northwestern part of the city. This is among the oldest religious sites in Nepal. Although the site is considered Buddhist, it is revered by both Buddhists and Hindus. The stupa consists of a dome at the base; above the dome, there is a cubic structure with the eyes of Buddha looking in all four directions. [clarification needed] There are pentagonal Toran above each of the four sides, with statues engraved on them. Behind and above the torana there are thirteen tiers. Above all the tiers, there is a small space above which lies a gajur. Ranipokhari which is translated as "Queen's Pond" is a historic artificial pond that nestled in the heart of Kathmandu. It was built by king Pratap Mall in 1670 AD for his beloved queen after she lost her son who couldn't recover from her loss. A large stone statue of an elephant in south signifies the image of Pratap Malla and his two sons. Balgopaleshwor Temple stands still inside the temple above the pond. Rani Pokhari is opened once a year during the final day of Tihar i.e. Bhai Tika and Chhath festival. The world largest Chhath takes place every year in Ranipokhari. The pond is one of Kathmandu's most famous landmarks and is known for its religious and aesthetic significance. Kathmandu valley is described as "an enormous treasure house of art and sculptures", which are made of wood, stone, metal, and terracotta, and found in profusion in temples, shrines, stupas, gompas, chaityasm and palaces. The art objects are also seen in street corners, lanes, private courtyards and in open ground. Most art is in the form of icons of gods and goddesses. Kathmandu valley has had this art treasure for a very long time, but received worldwide recognition only after the country opened to the outside world in 1950. The religious art of Nepal and Kathmandu in particular consists of an iconic symbolism of the Mother Goddesses such as: Bhavani, Durga, Gaja-Lakshmi, Hariti-Sitala, Mahsishamardini, Saptamatrika (seven mother goddesses), and Sri-Lakshmi(wealth-goddess). From the 3rd century BCE, apart from the Hindu gods and goddesses, Buddhist monuments from the Ashokan period (it is said that Ashoka visited Nepal in 250 BC) have embellished Nepal in general and the valley in particular. These art and architectural edifices encompass three major periods of evolution: the Licchavi or classical period (500 to 900 AD), the post-classical period (1000 to 1400 AD), with strong influence of the Palla art form; the Malla period (1400 onwards) that exhibited explicitly tantric influences coupled with the art of Tibetan Demonology. Kathmandu is home to a number of museums and art galleries, including the National Museum of Nepal and the Natural History Museum of Nepal. Nepal's art and architecture is an amalgamation of two ancient religions, Hinduism and Buddhhism. These are amply reflected in the many temples, shrines, stupas, monasteries, and palaces in the seven well-defined Monument Zones of the Kathmandu valley are part of a UNESCO World Heritage Site. This amalgamation is also reflected in the planning and exhibitions in museums and art galleries throughout Kathmandu and its sister cities of Patan and Bhaktapur. The museums display unique artefacts and paintings from the 5th century CE to the present day, including archaeological exportation. The National Museum is in the western part of Kathmandu, near the Swayambhunath stupa in an historical building. This building was constructed in the early 19th century by General Bhimsen Thapa. It is the most important museum in the country, housing an extensive collection of weapons, art and antiquities of historic and cultural importance. The museum was established in 1928 as a collection house of war trophies and weapons, and the initial name of this museum was Chhauni Silkhana, meaning "the stone house of arms and ammunition". Given its focus, the museum contains many weapons, including locally made firearms used in wars, leather cannons from the 18th–19th century, and medieval and modern works in wood, bronze, stone and paintings. The Tribhuvan Museum contains artefacts related to the King Tribhuvan (1906–1955). It has a variety of pieces including his personal belongings, letters and papers, memorabilia related to events he was involved in and a rare collection of photos and paintings of Royal family members. The Mahendra Museum is dedicated to king Mahendra of Nepal (1920–1972). Like the Tribhuvan Museum, it includes his personal belongings such as decorations, stamps, coins and personal notes and manuscripts, but it also has structural reconstructions of his cabinet room and office chamber. The Hanumandhoka Palace, a lavish medieval palace complex in the Durbar, contains three separate museums of historic importance. These museums include the Birendra museum, which contains items related to the second-last monarch, Birendra of Nepal. The enclosed compound of the Narayanhity Palace Museum is in the north-central part of Kathmandu. "Narayanhity" comes from Narayana, a form of the Hindu god Lord Vishnu, and Hiti, meaning "water spout" (Vishnu's temple is opposite the palace, and the water spout is east of the main entrance to the precinct). Narayanhity was a new palace, in front of the old palace built in 1915, and was built in 1970 in the form of a contemporary Pagoda. It was built on the occasion of the marriage of King Birenda Bir Bikram Shah, then heir apparent to the throne. The southern gate of the palace is at the crossing of Prithvipath and Darbar Marg roads. The palace area covers (30 hectares (74 acres)) and is fully secured with gates on all sides. This palace was the scene of the Nepali royal massacre. After the fall of the monarchy, it was converted to a museum. The Taragaon Museum presents the modern history of the Kathmandu Valley. It seeks to document 50 years of research and cultural heritage conservation of the Kathmandu Valley, documenting what artists photographers architects anthropologists from abroad had contributed in the second half of the 20th century. The actual structure of the museum showcases restoration and rehabilitation efforts to preserve the built heritage of Kathmandu. It was designed by Carl Pruscha (master-planner of the Kathmandy Valley) in 1970 and constructed in 1971. Restoration works began in 2010 to rehabilitate the Taragaon hostel into the Taragaon Museum. The design uses local brick along with modern architectural design elements, as well as the use of circle, triangles and squares. The museum is within a short walk from the Boudhnath stupa, which itself can be seen from the museum tower. Kathmandu is a centre for art in Nepal, displaying the work of contemporary artists in the country and also collections of historical artists. Patan in particular is an ancient city noted for its fine arts and crafts. Art in Kathmandu is vibrant, demonstrating a fusion of traditionalism and modern art, derived from a great number of national, Asian, and global influences. Nepali art is commonly divided into two areas: the idealistic traditional painting known as Paubhas in Nepal and perhaps more commonly known as Thangkas in Tibet, closely linked to the country's religious history and on the other hand the contemporary western-style painting, including nature-based compositions or abstract artwork based on Tantric elements and social themes of which painters in Nepal are well noted for. Internationally, the British-based charity, the Kathmandu Contemporary Art Centre is involved with promoting arts in Kathmandu. The Srijana Contemporary Art Gallery, inside the Bhrikutimandap Exhibition grounds, hosts the work of contemporary painters and sculptors, and regularly organises exhibitions. It also runs morning and evening classes in the schools of art. Also of note is the Moti Azima Gallery, in a three-storied building in Bhimsenthan which contains an impressive collection of traditional utensils and handmade dolls and items typical of a medieval Newar house, giving an important insight into Nepali history. The J Art Gallery is also in Kathmandu, near the Royal Palace in Durbarmarg, Kathmandu and displays the artwork of eminent, established Nepali painters. The Nepal Art Council Gallery, in the Babar Mahal, on the way to Tribhuvan International Airport contains artwork of both national and international artists and extensive halls regularly used for art exhibitions. The National Library of Nepal is in Patan. It is the largest library in the country with more than 70,000 books. English, Nepali, Sanskrit, Hindi, and Nepal Bhasa books are found here. The library is in possession of rare scholarly books in Sanskrit and English dating from the 17th century AD. Kathmandu also contains the Keshar Library, in the Keshar Mahal on the ground floor of the Ministry of Education building. This collection of around 45,000 books is derived from a personal collection of Keshar Shamsher Jang Bahadur Rana. It covers a wide range of subjects including history, law, art, religion, and philosophy, as well as a Sanskrit manual of Tantra, which is believed to be over 1,000 years old. The 2015 earthquake caused severe damage to the Ministry of Education building, and the contents of the Kaiser Library have been temporarily relocated. The Asa Archives are also noteworthy. They specialise in medieval history and religious traditions of the Kathmandu Valley. The archives, in Kulambhulu, have a collection of some 6,000 loose-leaf handwritten books and 1,000 palm-leaf manuscripts (mostly in Sanskrit or Nepal Bhasa) and a manuscript dated to 1464. Kathmandu is home to Nepali cinema and theatres. The city contains several theatres, including the National Dance Theatre in Kanti Path, the Ganga Theatre, the Himalayan Theatre and the Aarohan Theater Group founded in 1982. The M. Art Theater is based in the city. The Gurukul School of Theatre organises the Kathmandu International Theater Festival, attracting artists from all over the world. A mini theatre is also at the Hanumandhoka Durbar Square, established by the Durbar Conservation and Promotion Committee. Kathmandu has a number of cinemas (old single screen establishments and some new multiplexes) showing Nepali, Bollywood, and Hollywood films. Some old establishments include Vishwajyoti Cinema Hall, Jai Nepal Hall, Kumari Cinema Hall, Gopi Krishna Cinema Hall and Guna Cinema Hall. Kathmandu also houses some international standard cinema theatres and multiplexes, such as QFX Cinemas, Cine De Chef, Fcube Cinemas, Q's Cinemas Big Movies, BSR Movies etc. Kathmandu is the centre of music and dance in Nepal, and these art forms are integral to understanding the city. Musical performances are organised in cultural venues. Music is a part of the traditional aspect of Kathmandu. Gunla is the traditional music festival according to Nepal Sambat. Newar music originated in Kathmandu. Furthermore, music from all over Nepal can be found in Kathmandu. A number of hippies visited Kathmandu during the 1970s and introduced rock and roll, rock, and jazz to the city. Kathmandu is noted internationally for its jazz festival, popularly known as Jazzmandu. It is the only jazz festival in the Himalayan region and was established in March 2002. The festival attracts musicians from countries worldwide, such as Australia, Denmark, United States, Benin, and India. The city has been referenced in numerous songs, including works by Cat Stevens ('Katmandu', Mona Bone Jakon (1970)), Bob Seger ('Katmandu', Beautiful Loser (1975)), Rush ('A Passage to Bangkok', Pulling into Kathmandu; 2112, 1976), Krematorij ('Kathmandu', Three Springs (2000)), Fito Páez (Tráfico por Katmandú – "Traffic through Kathmandu") and Cavalcade ('Kathmandu Kid') 2019. 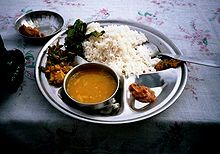 The staple food of most people in Kathmandu is dal bhat. This consists of rice and lentil soup, generally served with vegetable curries, achar and sometimes Chutney. Momo, a type of Nepali version of Tibetan dumpling, has become prominent in Nepal with many street vendors and restaurants selling it. It is one of the most popular fast foods in Kathmandu. Various Nepali variants of momo including buff (i.e. buffalo) momo, chicken momo, and vegetarian momo are famous in Kathmandu. Most of the cuisines found in Kathmandu are non-vegetarian. However, the practice of vegetarianism is not uncommon, and vegetarian cuisines can be found throughout the city. Consumption of beef is very uncommon and considered taboo in many places. Buff (meat of water buffalo) is very common. There is a strong tradition of buff consumption in Kathmandu, especially among Newars, which is not found in other parts of Nepal. Consumption of pork was considered taboo until a few decades ago. Due to the intermixing with Kirat cuisine from eastern Nepal, pork has found a place in Kathmandu dishes. A fringe population of devout Hindus and Muslims consider it taboo. The Muslims forbid eating buff as from Quran while Hindus eat all varieties except Cow's meat as they consider Cow to be a goddess and symbol of purity. The chief breakfast for locals and visitors is mostly Momo or Chowmein. Kathmandu has a larger proportion of tea drinkers than coffee drinkers. Tea is widely served but is extremely weak by western standards. It is richer and contains tea leaves boiled with milk, sugar and spices. Alcohol is widely drunk, and there are numerous local variants of alcoholic beverages. Drinking and driving is illegal, and authorities have a zero tolerance policy. Ailaa and thwon (alcohol made from rice) are the alcoholic beverages of Kathmandu, found in all the local bhattis (alcohol serving eateries). Chhyaang, tongba (fermented millet or barley) and rakshi are alcoholic beverages from other parts of Nepal which are found in Kathmandu. However, shops and bars in Kathmandu widely sell western and Nepali beers. Samyak, a Buddhist festival during which statues of Buddhas from the ancient monasteries are displayed together. Note the statue of Hanuman next to the Buddhas in the picture, a common example of religious harmony in Kathmandu. President of Nepal Dr. Ram Baran Yadav observing the street festival of Yenya, which literally means "festival of Kathmandu"
Most of the fairs and festivals in Kathmandu originated in the Malla period or earlier. Traditionally, these festivals were celebrated by Newars. In recent years, these festivals have found wider participation from other Kathmanduites as well. 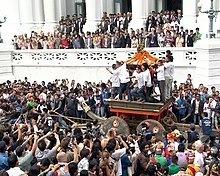 As the capital of the Republic of Nepal, various national festivals are celebrated in Kathmandu. With mass migration to the city, the cultures of Khas from the west, Kirats from the east, Bon/Tibetan from the north, and Mithila from the south meet in the capital and mingle harmoniously. The festivities such as the Ghode (horse) Jatra, Indra Jatra, Dashain Durga Puja festivals, Shivratri and many more are observed by all Hindu and Buddhist communities of Kathmandu with devotional fervor and enthusiasm. Social regulation in the codes enacted incorporate Hindu traditions and ethics. These were followed by the Shah kings and previous kings, as devout Hindus and protectors of Buddhist religion. Cultural continuity has been maintained for centuries in the exclusive worship of goddesses and deities in Kathmandu and the rest of the country. These deities include the Ajima, Taleju (or Tulja Bhavani), Digu taleju, and Kumari (the living goddess). The artistic edifices have now become places of worship in the everyday life of the people, therefore a roster is maintained to observe annual festivals. There are 133 festivals held in the year. Some of the traditional festivals observed in Kathmandu, apart from those previously mentioned, are Bada Dashain, Tihar, Chhath, Maghe Sankranti, Naga Panchami, Janai Poornima, Pancha Dan, Teej/Rishi Panchami, Pahan Charhe, Jana Baha Dyah Jatra (White Machchhendranath Jatra), and Matatirtha Aunsi. Assumedly, together with the kingdom of Licchhavi (c. 400 to 750), Hinduism and the endogam social stratification of the Caste was established in Kathmandu Valley. The Pashupatinath Temple, Changu Narayan temple (the oldest), and the Kasthamandap are of particular importance to Hindus. Other notable Hindu temples in Kathmandu and the surrounding valley include Bajrayogini Temple, Dakshinkali Temple, Guhyeshwari Temple, and the Sobha Bhagwati shrine. The Bagmati River which flows through Kathmandu is considered a holy river both by Hindus and Buddhists, and many Hindu temples are on the banks of this river. The importance of the Bagmati also lies in the fact that Hindus are cremated on its banks, and Kirants are buried in the hills by its side. According to the Nepali Hindu tradition, the dead body must be dipped three times into the Bagmati before cremation. The chief mourner (usually the first son) who lights the funeral pyre must take a holy riverwater bath immediately after cremation. Many relatives who join the funeral procession also take bath in the Bagmati River or sprinkle the holy water on their bodies at the end of cremation as the Bagmati is believed to purify people spiritually. 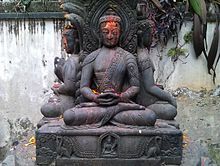 Buddhism started in Kathmandu with the arrival of Buddhist monks during the time of Buddha (c. 563 – 483 BCE). They started a forest monastery in Sankhu. This monastery was renovated by Shakyas after they fled genocide from Virudhaka (rule: 491–461 BCE). During the Hindu Lichchavi era (c. 400 to 750), various monasteries and orders were created which successively led to the formation of Newar Buddhism, which is still practised in the primary liturgical language of Hinduism, Sanskrit. Legendary Princess Bhrikuti (7th-century) and artist Araniko (1245–1306 CE) from that tradition of Kathmandu valley played a significant role in spreading Buddhism in Tibet and China. There are over 108 traditional monasteries (Bahals and Bahis) in Kathmandu based on Newar Buddhism. Since the 1960s, the permanent Tibetan Buddhist population of Kathmandu has risen significantly so that there are now over fifty Tibetan Buddhist monasteries in the area. Also, with the modernisation of Newar Buddhism, various Theravada Bihars have been established. Kirant Mundhum is one of the indigenous animistic practices of Nepal. It is practised by Kirat people. Some animistic aspects of Kirant beliefs, such as ancestor worship (worship of Ajima) are also found in Newars of Kirant origin. Ancient religious sites believed to be worshipped by ancient Kirats, such as Pashupatinath, Wanga Akash Bhairabh (Yalambar) and Ajima are now worshipped by people of all Dharmic religions in Kathmandu. Kirats who have migrated from other parts of Nepal to Kathmandu practice Mundhum in the city. Sikhism is practised primarily in Gurudwara at Kupundole. An earlier temple of Sikhism is also present in Kathmandu which is now defunct. Jainism is practised by a small community. A Jain temple is present in Gyaneshwar, where Jains practice their faith. According to the records of the Spiritual Assembly of the Baha'is of Nepal, there are approximately 300 Baha'is in Kathmandu valley. They have a National Office in Shantinagar, Baneshwor. The Baha'is also have classes for children at the National Centre and other localities in Kathmandu. Islam is practised in Kathmandu but Muslims are a minority, accounting for about 4.2% of the population of Nepal. It is said that in Kathmandu alone there are 170 Christian churches. Christian missionary hospitals, welfare organisations, and schools are also operating. Nepali citizens who served as soldiers in Indian and British armies, who had converted to Christianity while in service, on return to Nepal continue to practice their religion. They have contributed to the spread of Christianity and the building of churches in Nepal and in Kathmandu, in particular. The oldest modern school in Nepal is Durbar High School, and the oldest college, Tri Chandra College, are both in Kathmandu city. The largest (according to number of students and colleges), oldest and most distinguished university in Nepal is in Kirtipur and is called Tribhuvan University. The second largest university, Kathmandu University (KU), is in Dhulikhel, Kavre on the outskirts of Kathmandu. It is the second oldest university in Nepal, established in November 1991. Not surprisingly the best schools and colleges of Nepal are located in Kathmandu and its adjoining cities. Every year thousands of students from all over Nepal arrive at Kathmandu to get admission in the various schools and colleges. One of the key concerns of educationists and concerned citizens is the massive outflux of students from Nepal to outside Nepal for studies. Every year thousands of students apply for No objection certificates for studying abroad. Consultancy firms specialising in preparing students to go abroad can be found in all prominent locations. The reason for such an outflux range from perceived low quality of education, political instability, less opportunities in job market, opportunities of earning while learning abroad and better job prospects with an international degree. Institute of Medicine, the central college of Tribhuwan University is the first medical college of Nepal and is in Maharajgunj, Kathmandu. It was established in 1972 and started to impart medical education from 1978. Other major institution include Patan Academy of Health Sciences, Kathmandu Medical College, Nepal Medical College, KIST Medical College, Nepal Army Institute of Health Sciences, National Academy of Medical Sciences (NAMS) and Kathmandu University School of Medical Sciences (KUSMS), are also in or around Kathmandu. Football and Cricket are the most popular sports among the younger generation in Nepal and there are several stadiums in the city. The sport is governed by the National Sports Council from its headquarters in Kathmandu. The only international football stadium in the city is the Dasarath Rangasala Stadium, a multi-purpose stadium used mostly for football matches and cultural events, in the neighbourhood of Tripureshwor. It is the largest stadium in Nepal with a capacity of 25,000 spectators, built in 1956. Martyr's Memorial League is also held in this ground every year. The stadium was renovated with Chinese help before the 8th South Asian Games were held in Kathmandu and had floodlights installed. Kathmandu is home to the oldest football clubs of Nepal such as RCT, Sankata and NRT. Other prominent clubs include MMC, Machhindra FC, Tribhuvan Army Club (TAC) and MPC. Kathmandu is also home of some of the oldest cricket clubs in Nepal, such as Yengal Sports Club. Kathmandu has the only recognised international cricket ground in the country, TU Cricket Ground at the Tribhuvan University in Kirtipur. The Mulpani Cricket Stadium is the under-construction cricket stadium in Mulpani, Kathmandu which will be the largest cricket stadium in the country with capacity of 30,000. Kathmandu Kings XI represents Kathmandu in Everest Premier League. An international stadium for swimming events is in Satdobato, Lalitpur, near Kathmandu. The ANFA Technical Football Center is just adjacent to this stadium. The total length of roads in Nepal is recorded to be (17,182 km (10,676 mi)), as of 2003–04. This fairly large network has helped the economic development of the country, particularly in the fields of agriculture, horticulture, vegetable farming, industry and also tourism. In view of the hilly terrain, transportation takes place in Kathmandu are mainly by road and air. Kathmandu is connected by the Tribhuvan Highway to the south, Prithvi Highway to the west and Araniko Highway to the north. The BP Highway, connecting Kathmandu to the eastern part of Nepal is under construction. The main international airport serving Kathmandu and thus Nepal is the Tribhuvan International Airport, about 6 kilometres (3.7 mi) from the city centre. Operated by the Civil Aviation Authority of Nepal it has two terminals, one domestic and one international. At present, about 26 international airlines connect Nepal to other destinations in Europe, Asia and the Middle East, to cities such as Istanbul, Delhi, Mumbai, Bangalore, Kolkata, Singapore, Bangkok, Kuala Lumpur, Dhaka, Paro, Lhasa, Chengdu, and Guangzhou. Since 2013, Turkish Airlines connects Istanbul to Kathmandu. Oman Air also connects Muscat to Kathmandu since 2010. Regionally, several Nepali airlines operate from the city, including Buddha Air, Nepal Airlines and Yeti Airlines, to other major towns across Nepal. Sajha Yatayat provides regular bus services throughout Kathmandu and the surrounding Valley. Other bus companies including micro-bus companies operate several unscheduled routes. Trolleybusses used to operate on the route between Tripureshwor and Surya Binak on a 13 kilometre route. Ropeways are another important transportation means in hilly terrain. A ropeway operated between Kathmandu and Hetauda over a length of 43 km (27 mi) which carried 25 tonnes of goods per hour. It has since been discontinued due to poor carrying capacity and maintenance issues. During the Rana period, a ropeway was constructed between Kathmandu (then Mathathirtha) to Dhorsing (Makawanpur) of over 22 km (14 mi) in length, which carried cargo of 8 tonnes per hour. Now there is a cable car operated in Kathmandu in Chandragiri Hills. Healthcare in Kathmandu is the most developed in Nepal, and the city and surrounding valley is home to some of the best hospitals and clinics in the country. Bir Hospital is the oldest, established in July 1889 by Bir Shamsher Jang Bahadur Rana. Notable hospitals include Bir Hospital, Nepal Medical College and Teaching Hospital (Jorpati), Tribhuwan University Institute of Medicine (Teaching Hospital), Patan Hospital, Kathmandu Model Hospital, Scheer Memorial Hospital, Om Hospital, Norvic Hospital, Grande International Hospital, Nobel Hospital and many more. The city is supported by specialist hospitals/clinics such as Shahid Shukra Tropical Hospital, Shahid Gangalal Foundation, Kathmandu Veterinary Hospital, Nepal Eye Hospital, Kanti Children's Hospital, Nepal International Clinic (Travel and Mountain medicine centre), Neuro Center, Spinal Rehabilitation centre and Bhaktapur Cancer Hospital. Most of the general hospitals are in the city centre, although several clinics are elsewhere in Kathmandu district. Tilganga Institute of Ophthalmology is an Ophthalmological hospital in Kathmandu. It pioneered the production of low cost intraocular lenses (IOLs), which are used in cataract surgery. The team of Dr. Sanduk Ruit in the same hospital pioneered sutureless small-incision cataract surgery (SICS), a technique which has been used to treat 4 million of the world's 20 million people with cataract blindness. Kathmandu is the television hub of Nepal. Nepal Television, established in 1985, is the oldest and most watched television channel in Nepal, as is government-owned NTV 2 Metro, Channel Nepal, Image Channel, Kantipur Television, Sagarmatha TV, Himalayan Television and other channels. The headquarters of many of the country's news outlets are also in the city including Kathmandu Tribune, the government-owned Gorkhapatra, the oldest national daily newspaper in Nepal, The Kathmandu Post, Nepali Times, Kantipur Publications and its paper Kantipur, Naya Patrika the largest selling Nepali language paper, The Himalayan Times, the largest selling English broadsheet in Nepal, Karobar Economic Daily and Aarthik Abhiyan National Daily are the only economic daily in Nepal and Jana Aastha National Weekly. Nepal Republic Media, the publisher of MyRepublica, joined a publishing alliance with the International Herald Tribune (IHT), to publish the Asia Pacific Edition of IHT from Kathmandu from 20 July 2011. There is a state-run National News Agency (RSS). Radio Nepal is a state-run organisation which operates national and regional radio stations. These stations are: Hits FM (Nepal), HBC 94 FM, Radio Sagarmatha, Kantipur FM and Image FM. The BBC also has an FM broadcasting station in Kathmandu. Among them small part of FM radio come from Community radio Station, that are Radio Pratibodh F.M. – 102.4 MHz, Radio Upatyaka – 87.6 MHz etc. The Board of the International Buddhist Meditation Centre at Kathmandu in 1995. Victor Skumin and Gyan Jyoti Kansakar (center of the group). Kathmandu Metropolitan City (KMC), in order to promote international relations has established an International Relations Secretariat (IRC). KMC's first international relationship was established in 1975 with the city of Eugene, Oregon, United States. This activity has been further enhanced by establishing formal relationships with 8 other cities: Motsumoto City (Nagano Prefecture, Japan), Rochester (New York (state), U.S.), Yangon (formerly Rangoon, Myanmar), Xi'an (Shaanxi, China), Minsk (Belarus), and Pyongyang (North Korea). KMC's constant endeavour is to enhance its interaction with SAARC countries, other International agencies and many other major cities of the world to achieve better urban management and developmental programs for Kathmandu. Kathmandu is home to several international and regional organisations, including the South Asian Association for Regional Cooperation (SAARC). International Buddhist Meditation Center operates in Kathmandu. ^ "An Overview of the Central Development Region (CR)" (PDF). Internal-displacement.org. Archived from the original (PDF) on 2 February 2012. Retrieved 25 November 2013. ^ "Definition of Kathmandu in English". Oxford Dictionaries. Retrieved 25 September 2015. ^ "CPN-UML's Bidya Sundar Shakya elected Kathmandu Metro City mayor". Kathmandu Post. 28 May 2017. ^ "Introduction". Kathmandu Metropolitan City, Government of Nepal. Retrieved 12 December 2009. ^ Malla, Kamal P. (December 1983). "The Limits of Surface Archaeology" (PDF). CNAS Journal. Tribhuvan University. 11 (1). Retrieved 28 July 2012. ^ a b "सुस्त उत्खनन » पुरातत्व » सम्पदा :: नेपाल". Ekantipur.com. 9 June 2010. Archived from the original on 11 September 2010. Retrieved 15 January 2012. ^ Levi, Sylvain. Nepal. p. 50. Retrieved 1 December 2013. ^ "History". Government of Nepal. Retrieved 12 December 2009. ^ "History:Ancient Nepal". Newa Travels and Tours. New Travels and Tours Ltd. Archived from the original on 21 July 2009. Retrieved 18 December 2009. ^ a b Apr, Wed (21 April 2010). "Article:झीसं पत्याः यानाच्वनागु अन्धविश्वास – Author:विपेन्द्र महर्जन Nepalmandal". Nepalmandal.com. Retrieved 15 January 2012. ^ "A Short History of Sanskrit Buddhist Manuscripts". Dsbcproject.org. Archived from the original on 14 April 2013. Retrieved 24 November 2013. ^ "Kathmandu Metropolitan City". Kathmandu.gov.np. Archived from the original on 22 June 2012. Retrieved 24 November 2013. ^ a b "काष्ठमण्डप कि होममण्डप". Gorkhapatra.org.np. Archived from the original on 6 July 2012. Retrieved 24 November 2013. ^ "राष्ट्रपति अचानक ग्यालरीमा | कला र शैली | :: कान्तिपुर". Ekantipur.com. Archived from the original on 20 January 2012. Retrieved 15 January 2012. ^ Dietrich, Angela (1996). "Buddhist Monks and Rana Rulers: A History of Persecution". Buddhist Himalaya: A Journal of Nagarjuna Institute of Exact Methods. Archived from the original on 1 October 2013. Retrieved 24 September 2013. ^ Lal, C. K. (16 February 2001). "The Rana resonance". Nepali Times. Retrieved 24 September 2013. ^ "Kathmandu Metropolitan City Office – Introduction". Kathmandu Metropolitan City Office. Archived from the original on 23 June 2012. Retrieved 14 August 2014. ^ a b c "Kathmandu Facts". Kathmandu Metropolitan City Council, Government of Nepal. Retrieved 12 December 2009. ^ "Geography". Kathmandu Metropolitan City. Retrieved 12 December 2009. ^ Shreshta, S.H (2005). Nepal in Maps. Kathmandu valley. Kathmandu: Educational Publishing House. pp. 102–14. ^ "Kathmandu Metropolitan City Office - Ward No. 16". 22 June 2012. Archived from the original on 22 June 2012. ^ Shreshta, Vinod Prasad (2007). A Concise Geography of Nepal. Climate. Kathmandu: Mandal Publications. pp. 24–28. ISBN 978-99946-55-04-5. ^ a b "Average Temperature and Rainfall of Kathmandu City". Nepal Vista. Nepal Bureau of Standards, Weather Meteorology. Retrieved 6 November 2009. ^ "Normals from 1981–2010" (PDF). Department of Hydrology and Meteorology (Nepal). Retrieved 14 October 2012. ^ "World Weather Information Service – Kathmandu". World Meteorological Organization. Retrieved 16 April 2013. ^ Cappelen, John; Jensen, Jens. "Nepal – Kathmandu" (PDF). Climate Data for Selected Stations (1931–1960) (in Danish). Danish Meteorological Institute. p. 190. Archived from the original (PDF) on 16 January 2013. Retrieved 16 April 2013. ^ "Nepal – Katmandu". Centro de Investigaciones Fitosociológicas. Retrieved 16 April 2013. ^ Lodge, Andrew (21 March 2014). "Has air pollution made Kathmandu unliveable?". The Guardian. ISSN 0261-3077. Retrieved 4 April 2017. ^ "Clearing the air in Kathmandu". International Institute for Environment and Development. 7 June 2016. Retrieved 4 April 2017. ^ "You are being redirected..." thehimalayantimes.com. 24 March 2017. Retrieved 4 April 2017. ^ "WHO Global Urban Ambient Air Pollution Database (update 2016)". World Health Organization. Retrieved 4 April 2017. ^ "Ambient (outdoor) air quality and health". World Health Organization. ^ "Ambient (outdoor) air quality and health". World Health Organization. Retrieved 4 April 2017. ^ "Pollution". www.pollution.gov.np. Archived from the original on 6 April 2017. Retrieved 4 April 2017. ^ "AirNow". airnow.gov. Retrieved 4 April 2017. ^ Lewis, Todd T. "Buddhism, Himalayan Trade, and Newar Merchants". Retrieved 28 July 2012. ^ a b c "Economy". Kathmandu Metropolitan City, Government of Nepal. Retrieved 20 December 2009. ^ a b c d "Economy". Kathmandu Metropolitan City Office. Retrieved 18 December 2009. ^ "Thamel". Nepali Times. Retrieved 12 March 2012. ^ "Hotels in Kathmandu". katmandu-hotels.com. Retrieved 13 December 2009. ^ "Metropolis Council". Kathmandu Metropolitan City Council, Government of Nepal. Retrieved 14 December 2009. ^ "Ward Profile". Kathmandu Metropolitan City Council, Government of Nepal. Retrieved 14 December 2009. ^ a b c d e "History and problem". Firefighters Volunteer Association of Nepal (FAN). Retrieved 20 December 2009. ^ Roshan Sharma (13 May 2016). "Living amidst filth". D+C, development and cooperation. Retrieved 7 July 2016. ^ "Census Nepal 2001" (PDF). Archived from the original (PDF) on 27 March 2009. Retrieved 13 December 2009. ^ "Population". Kathmandu Metropolitan City, Government of Nepal. Retrieved 12 December 2009. ^ "National Population and Housing Census 2011 - Kathmandu Metropolitan City" (PDF). www.cbs.gov.np. Archived from the original (PDF) on 18 April 2016. Retrieved 22 June 2018. 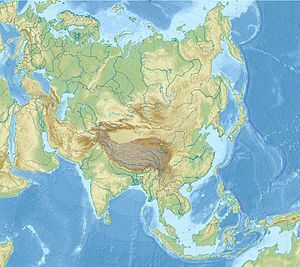 ^ "South Asia :: Nepal — the World Factbook - Central Intelligence Agency". ^ a b "Festivals". Kathmandu Metropolitan City, Government of Nepal. Retrieved 12 December 2009. ^ "Kathmandu Valley – Unesco World Heritage site". World Heritage – UNESCO.org. Retrieved 25 November 2009. ^ "Kathmandu Valley World Heritage site: Nepal" (PDF). Heritage Homeowner's Preservation Manual. Unesco, Kathmandu and Bangkok. 2006. Retrieved 25 November 2009. ^ "Hanuman Dhoka (Old Royal Palace)". Vegetarian-restaurants.net. Archived from the original on 5 February 2013. Retrieved 20 December 2009. ^ "Kumari Devi – The Living Goddess". Visitnepal.com. Retrieved 19 December 2009. ^ "SAARC tourism". Nepal.saarctourism.org. Archived from the original on 22 July 2010. Retrieved 4 July 2010. ^ a b c Mayhew, Bradley; Bindloss, Joe; Armington, Stan (2006). Nepal. Lonely Planet. p. 166. ISBN 978-1-74059-699-2. ^ "SAARC tourism". Nepal.saarctourism.org. Archived from the original on 22 July 2010. Retrieved 25 November 2013. ^ "Spiritual guides". Vegetarian-restaurants.net. 1 January 2006. Archived from the original on 12 June 2010. Retrieved 4 July 2010. ^ Snellgrove (1987), p. 365. ^ "Fables of Boudhanath and Changunarayan". nepalnews.com. Archived from the original on 5 July 2008. Retrieved 13 December 2009. ^ a b c Mayhew, Bradley; Bindloss, Joe; Armington, Stan (2006). Nepal. Lonely Planet. pp. 170–71. ISBN 978-1-74059-699-2. ^ "Ranipokhari, the Queen's pond". bossnepal.com. Retrieved 14 March 2018. ^ a b "Museums and Art Galleries of Nepal". Asiatravel.com. Archived from the original on 9 April 2013. Retrieved 18 December 2009. ^ a b c d e f g h i j k l m n o "Museums and art galleries". Asia Travel. Archived from the original on 9 April 2013. Retrieved 18 December 2009. ^ Woodhatch, Tom (1999). Nepal handbook. The Royal Palace. Footprint Travel Guides. p. 194. ISBN 978-1-900949-44-6. Retrieved 17 December 2009. ^ Mayhew, Bradley; Bindloss, Joe; Armington, Stan (2006). "History – Royal Troubles". Nepal. Lonely Planet. p. 38. ISBN 978-1-74059-699-2. Retrieved 17 December 2016. ^ Vibhaga, Nepal Sūcanā (1975). Narayanhity Royal Palace, home of the King of Nepal. Royal Palace. His Majesty's Govt., Ministry of Communications, Dept. of Information. p. 5. ^ a b "SPACES Magazine – Carl Pruscha". 25 May 2014. Archived from the original on 25 May 2014. ^ "Carl Pruscha » 06 Taragaon – Hostel". ^ "Kathmandu Contemporary Art Centre". Kathmanduarts.org. Retrieved 4 July 2010. ^ "Theatre fest begins". The Kathmandu Post. 18 November 2010. Archived from the original on 1 January 2014. Retrieved 1 January 2014. ^ Nepal. "KFC, Kathmandu – Restaurant Reviews". TripAdvisor. Retrieved 24 November 2013. ^ "Nepal: A whiff of sobriety". The Economist. 28 July 2012. Retrieved 25 November 2013. ^ "Katmandu as a world Heritage Site". Kathmandu Metropolitan City, Government of Nepal. Retrieved 25 November 2013. ^ L. S. Cousins (1996), "The dating of the historical Buddha: a review article", Journal of the Royal Asiatic Society (3)6(1): 57–63. ^ "Broadening the Nepali mind". ^ "Churches in Nepal". Across.co.nz. Retrieved 20 December 2009. ^ "US Department of State: Diplomacy in Action". US Department of State. Retrieved 20 December 2009. ^ "Science, research and technology in Nepal" (PDF). Bajracharya, Dayanand; Bhuju, Dinesh Raj; Pokhrel, Jiba Raj. 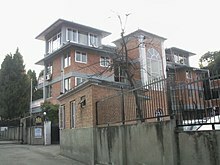 UNESCO Kathmandu Office. Retrieved 13 November 2009. ^ "List of medical colleges of Nepal". Medchrome.com. 26 December 2009. Retrieved 15 January 2012. ^ "Goal Programme – All-Nepal Football Association – 2001". FIFA. Retrieved 20 December 2009. ^ "Kathmandu Kings XI". kathmandukingsxi.com. ^ "Turkish Airlines – News – turkishairlines.com". Archived from the original on 19 August 2014. ^ "Oman Air to Launch Kathmandu". Routesonline.com. 11 February 2010. Retrieved 21 July 2017. ^ Shrestha, Elvin L. "Connecting Nepal with ropes - Business - Nepali Times". nepalitimes.com. ^ Ramon Magsaysay Award Foundation. "Ramon Magsaysay Award Foundation" (PDF). Rmaf.org.ph. Archived from the original (PDF) on 15 May 2013. Retrieved 24 November 2013. ^ "healio". Healio. May 2007. Retrieved 24 November 2013. ^ "Prince Mahidol Award". Prince Mahidol Award. 5 May 2009. Retrieved 24 November 2013. ^ Gyan Jyoti Kansakar (1997). "Culture of Health expands horizons". To Health Via Culture (3): 14–18. Archived from the original on 23 December 2018. Retrieved 23 December 2018. ^ "Outline of International Relations of Kathmandu Metropolitan City" (PDF). Katamandu Metropolitan City, Government of Nepal. Archived from the original (PDF) on 24 July 2011. Retrieved 20 December 2009. ^ "International Buddhist Meditation Center". facebook.com. Retrieved 15 December 2018. ^ a b c d e f g h i j "KMC International Relationship With Sister Cities". Retrieved 16 April 2018. ^ a b c d e "KMC International Relationship With Sister Cities". Retrieved 2 October 2017. ^ "Do You Know All The 14 Sister Cities Of Kathmandu Around The World?". 13 February 2017. Retrieved 8 September 2018. Mayhew, Bradley; Bindloss, Joe; Armington, Stan (2006). Lonely Planet. Lonely Planet. p. 416. ISBN 978-1-74059-699-2. Mayhew, Bradley; Bindloss, Joe; Armington, Stan (2006). Nepal. Lonely Planet. p. 166. ISBN 978-1-74059-699-2. Mayhew, Bradley; Brown, Lindsay; Vivequin, Wanda (2003). Lonely Planet Nepal. Lonely Planet. ISBN 978-1-74059-422-6. Shreshta, S.H (2005). Nepal in Maps. Kathmandu: Educational Publishing House. p. 129. Shreshta, Vinod Prasad (2007). A Concise Geography of Nepal. Kathmandu: Mandal Publications. p. 126. ISBN 978-99946-55-04-5. Snellgrove, David (1987). Indo-Tibetan Buddhism: Indian Buddhists & Their Tibetan Successors. Two Volumes. Shambhala Publications, Boston. ISBN 978-0-87773-311-9 (v. 1); ISBN 978-0-87773-379-9 (v. 2). Thapa, Rajesh Bahadur; Murayama, Yuji; Ale, Shailja (2008). "Kathmandu". Cities. 25: 45–57. doi:10.1016/j.cities.2007.10.001. Thapa, Rajesh; Murayama, Yuji (2009). "Examining Spatiotemporal Urbanization Patterns in Kathmandu Valley, Nepal: Remote Sensing and Spatial Metrics Approaches". Remote Sensing. 1 (3): 534–556. Bibcode:2009RemS....1..534T. doi:10.3390/rs1030534. Thapa, Rajesh Bahadur; Murayama, Yuji (2010). "Drivers of urban growth in the Kathmandu valley, Nepal: Examining the efficacy of the analytic hierarchy process". Applied Geography. 30: 70–83. doi:10.1016/j.apgeog.2009.10.002. Thapa, Rajesh Bahadur; Murayama, Yuji (2011). "Urban growth modeling of Kathmandu metropolitan region, Nepal". Computers, Environment and Urban Systems. 35: 25–34. doi:10.1016/j.compenvurbsys.2010.07.005. Vibhaga, Nepal Sūcanā (1975). Narayanhity Royal Palace, home of the King of Nepal. His Majesty's Govt., Ministry of Communications, Dept. of Information. p. 14. Watters, Thomas. (1904–05). On Yuan Chwang's Travels in India. (629–645 CE). Royal Asiatic Society. Second Indian Edition. Munshhiram Manoharlal Publishers, New Delhi. (1973). Woodhatch, Tom (1999). Nepal handbook. The Royal Palace. Footprint Travel Guides. p. 194. ISBN 978-1-900949-44-6. Retrieved 17 December 2009. 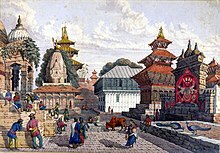 Wikimedia Commons has media related to Kathmandu. Wikivoyage has a travel guide for Kathmandu. This page was last edited on 21 April 2019, at 05:04 (UTC).